I thought I'd try to get my post done this morning before I take Tyler to the bus stop. This is my card for last week's SCS sketch. I really wanted to use my new Happy Birthday Cuttlebug folder and I thought the large panel would be perfect for me to do just that. I used Always Artichoke, Sahara Sand and a "burgundy" type paper from my miscellaneous paper stash. 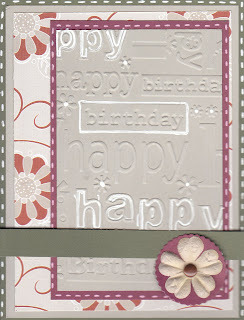 The patterned paper is from Cloud 9 Designs "Cinnamon Stick" collection. It all layered together easily and there's not much to really say about it! The only thing that I would change is the white pen work that I did on the embossed panel. That didn't quite have the affect I was hoping for. Still, by the time I did that, it was too late to change it. (Or perhaps I was just too lazy to do it again!) I used my small scallop circle nestabilities for the circle behind the Prima flower. That's it for me, today! Thanks for stopping by. I did also post a card yesterday, so be sure to scroll down if you missed that one! Very cute. I always have a hard time using these word embossed backgrounds but you did a great job. I like that Cloud Nine paper. How fun that you could coordinated a prima to the paper.